Three Sisters Farms produce beeswax candles, soap and skin care products. There are no fragrances or additives necessary with beeswax candles, because they smell sweet naturally. As a bonus, beeswax doesn’t drip or smoke much either. Their candles are reasonably priced for beeswax and start at $2.50 for a votive to $16.95 for a larger pillar. 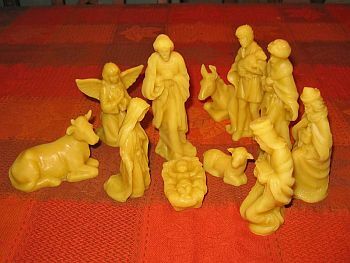 Shown here is a beautiful and detailed beeswax nativity scene set for $39.95. Visit the three sisters (Anastasia, Nadia, and Kyra) website for more information.